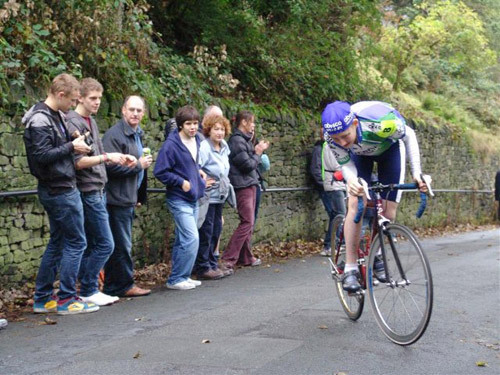 The Rake hill climb is a short and steep ‘classic’ British hill climb through the Lancashire town of Ramsbottom. 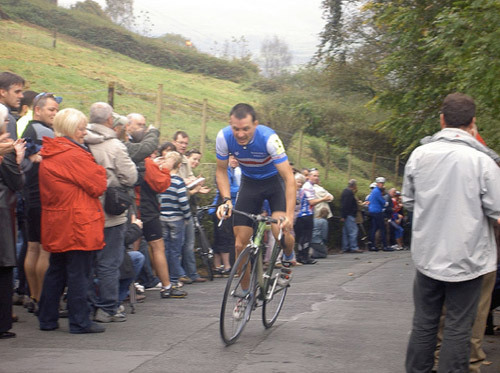 It has featured in the Tour of Britain and has been the location for three national championships (1999, 2005, 2012) A wide variety of riders have attempted to ride the rake including Chris Boardman, Malcolm Elliott, Graeme Obree, Chris Newton and Michael Hutchinson. I’ve ridden the Rake twice in two national championships – 2005 (11th) and 2012 (12th). START at lamp post No. 3 outside the public library in Carr Street, Ramsbottom. Proceed via Carr Street, Tanners Street, Rawson’s Rake and The Rake to FINISH at the lamp post opposite Exeter Cottage, Chapel Lane, Holcombe Brook approximately 120 yards before the junction with Helmshore Road. The climb begins with a gradient of around 10% for the first 300 metres, then there is a false flat for 100 metres until about half way where you turn right onto Rawsons rake and the climb starts to get really steep increasing to 20% with some sections around 22 – 23%. Right at the end there is a short 40 metres of almost flat. The road surface was not great. (though it has been resurfaced in 2012. Very smooth now). It’s said that back in 1929, Bury Cycling Club started a challenge to see who could ride the furthest up the rake without falling off! (link) As more managed to ride to the top, it became a test of who could climb the fastest. 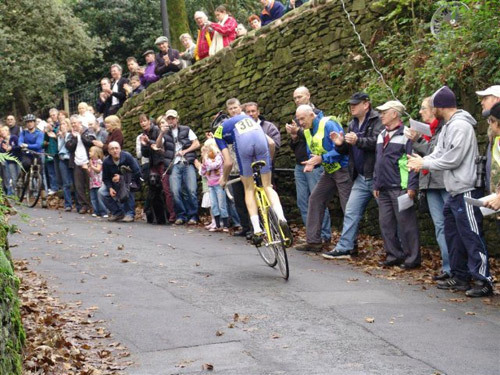 After the war, Peter Graham and Les Ingham would frequently train on the rake when preparing for their National hill climb championships (they won a total of 8 championships between them). In 1962, it became an open event. 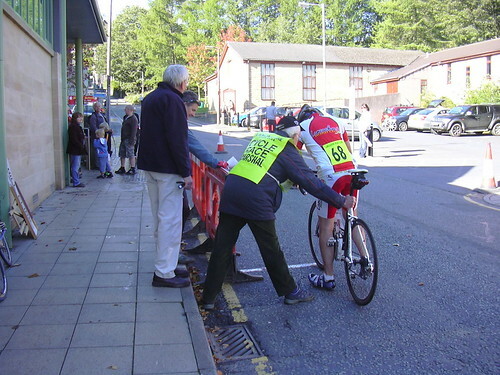 In 1991, the event was run by Lancashire Road club receiving sponsorship from local businesses. It could make claim to be one of the ‘world’s richest races’ With prizes of up t0 £1,000 for winning- not bad for two minutes work! On the lowers slopes I tried to pick up momentum and ride very fast. At the half way point, I got a time check from someone that I was 5 seconds in the lead. But, after this, the dynamics of the climb change, your momentum suddenly evaporates as you hit the section of 20-25%. With gears you can change down one or two. But, whatever bike you use it becomes a fight to keep the bike moving forward. After racing up the lower slopes, I was already in oxygen-debt so the steep section was really painful. 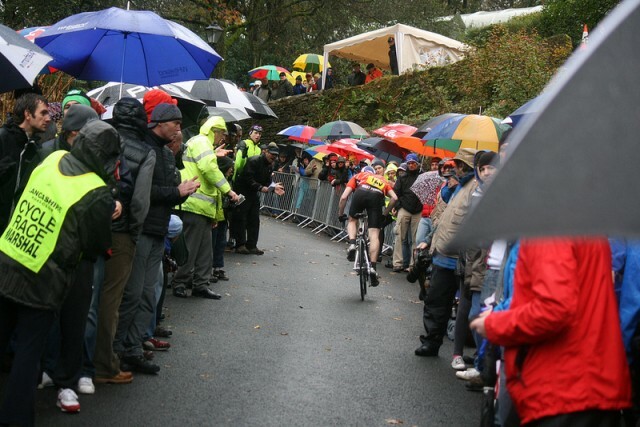 On the steep section, the crowd became quite thick and there was plenty of encouragement. But, when you’re digging so deep, you feel impervious to the surroundings around you. In 2005, the road was wet and on the steepest section, my back wheel skidded several times. It was an awful feeling. You’re on the limit – it’s hard enough fighting the gradient, and then to make things worse your momentum goes completely as you lose control of your back wheel; you have to pull on the bars and try to restart the forward movement. But, at this section of 20% sitting in the saddle is really not an option. When you get to the Rawlinson Rake, it’s actually hard to ride in a straight line. You find yourself veering over to the right hand side of the road. You will see many riders swerving all over the place. I think I was quite pleased to finish 11th, it was very close. Ben Greenwood pipped Jim Henderson by 0.3 seconds. In 2012, I had a great year in winning about 11 out of 12 opens, but didn’t do well on the Rake, finishing 12th. Being so steep, weight saving is vital. For many years most people would generally ride on fixed. However, in recent years you will see more riders using gears. 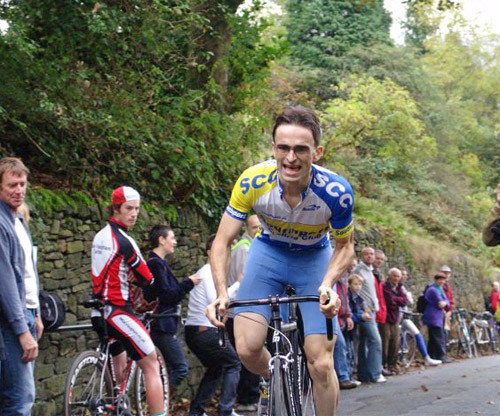 At the 2011 national hill climb championships, I asked Jim Henderson about this old debate – fixed v gears. (Jim won the 1999 national championship on the Rake (on fixed wheel) and has ridden the climb many times – he rode it 13 times before winning in 1999) However, Jim did say that road bikes are so light these days, that the advantage of fixed over gears is more diminished. Certainly having gears gives you greater flexibility and some advantage of greater efficiency for changing down as it gets steeper. Yet, although Jim said the difference is narrow, he still rides fixed. 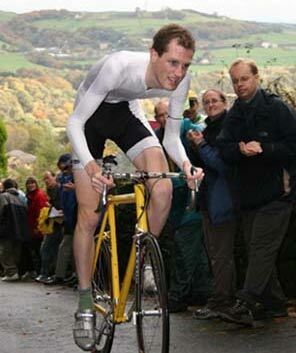 Chris Boardman said there was a big advantage to riding fixed in hill climbs, but that was quite a few years ago now. Fixed used to be lighter. (1 Kg, may save 2-4 seconds on the Rake. No effort wasted changing gears. Momentum effect of riding fixed, all power transferred into pedals. A change in wind or weather conditions can leave you with the wrong gear choice. Geared bikes are much lighter these days. I’m aiming for a 5 KG geared road bike. A fixed wouldn’t be much lighter. 2006 Bill Bell of Gemini BC – 2-24.6. 2.26 – 2.30 seems to be a popular winning time. 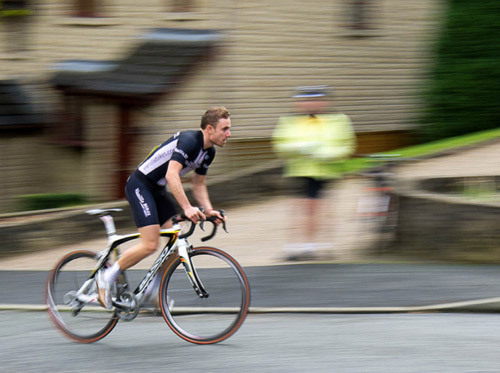 Saving 1kg on your bike may save 2 seconds on a climb which goes up 100 metres. But, if your back wheel skids on the surface you can lose 5-10 seconds. lower tyre pressure in rear. In 2011, Robert Gough was riding the Cat and Bec on a wet day. 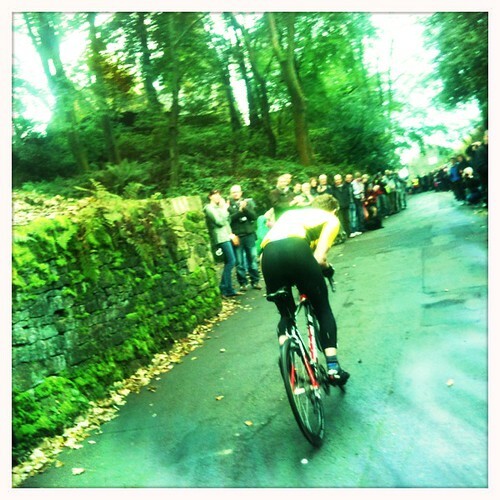 On the first climb, Catford CC, he reduced the tyre pressure in his rear wheel to, I think (60psi). He won in a time of 1.54. On the second climb, Bec CC he pumped his tyre back up to usual pressure, 100psi and suffered bad wheel spin finishing down on winner. Even Jim Henderson said he had wheel spin riding the rake in 2011 event after so many years of doing event. photo Jon the Scone Fancy a challenge? try riding the rake on a tandem. 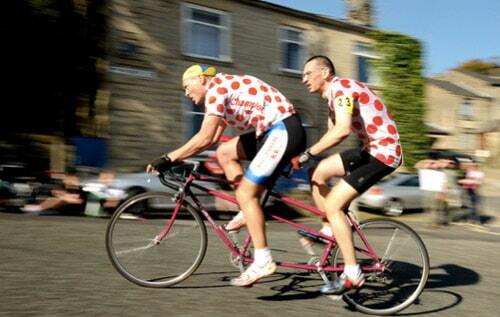 I believe this is Julian and Nicholas Monk of the Rossendale Road Club who did the climb in 5 minutes and 21 seconds. I try and do the steep part daily, but when I am feeling fit i go down the hill and do the entire thing. I was rather please with my times until reading this! Don’t worry about the times. That must rank as one of the best commutes in the land. It’s hard to find winners times for the Rake because they don’t seem to get published anywhere.